The Canalside Bike Trail is a beloved community resource and strong point of civic pride. The paved trail begins adjacent to Unity Park and hugs the shoreline along Barton Cove before ducking under the Turners Falls-Gill Bridge and continuing along the power canal southwest toward Greenfield. The Canalside Bike Trail ends at McClelland Farm Road in Deerfield. Yankee Magazine named it the "Best Urban Bike Path in New England" in 2010. Montague has thousands of acres of protected land that can be enjoyed for passive public recreation. Try Montague’s section of the 43 mile Robert Frost Trail, Meander down to the Rock Dam at the Connecticut River at Cabot Woods, or forage for blueberries on the Montague Plains. To help the public identify publicly accessible hiking areas, the Planning and Conservation Department has produced a simple guide to 6 areas that cover over 20 miles of trails. Each area has its own rules that you must respect, but it always good to be aware of hunting seasons, to wear safety orange, to carry out all trash and to keep dogs on a leash where required. 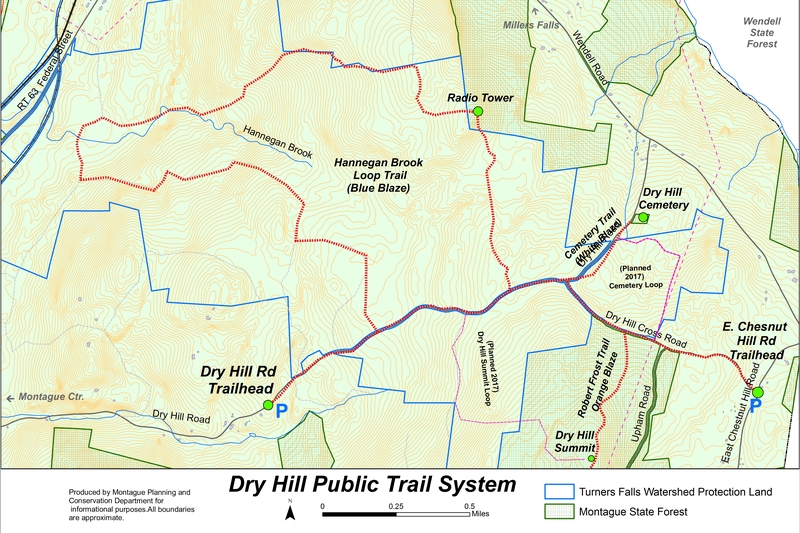 Dry Hill Trails Update 9/14/2016: This area includes well over 1,000 acres of protected drinking water supply land owned by the Turners Falls Water Department and is adjacent to the Montague State Forest. The trail system is made possible by a Massachusetts Recreational Trails Program grant, Turners Falls Water Department and the Town of Montague. Two trailhead kiosks have been installed at Dry Hill Rd and off East Chestnut Hill Road (See Map). Hannegan Brook Loop Trail (about 6 Miles or 2.5 hours) is now blazed. The Dry Hill Cemetery Trail is passable but not yet blazed.